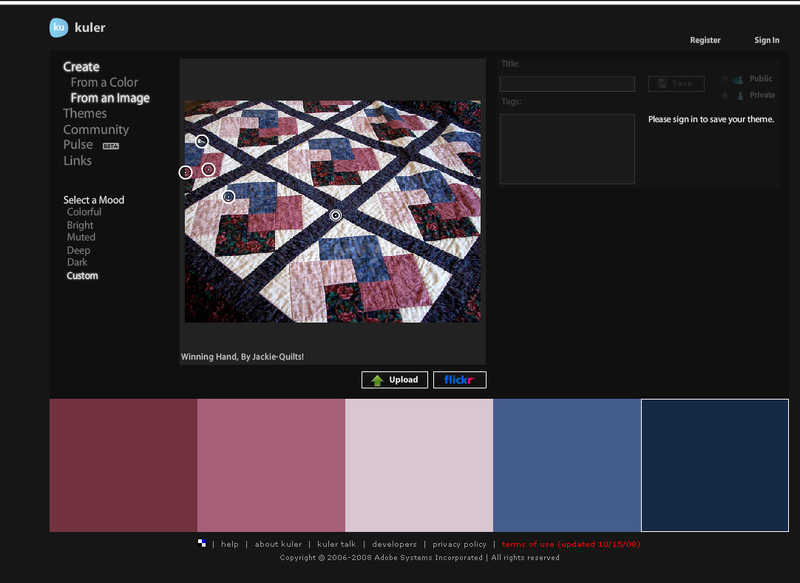 Sharon B from PinTangle just posted today about this new online site that if you’re a quilter, and you’re afraid of color, this would be a good online toy. 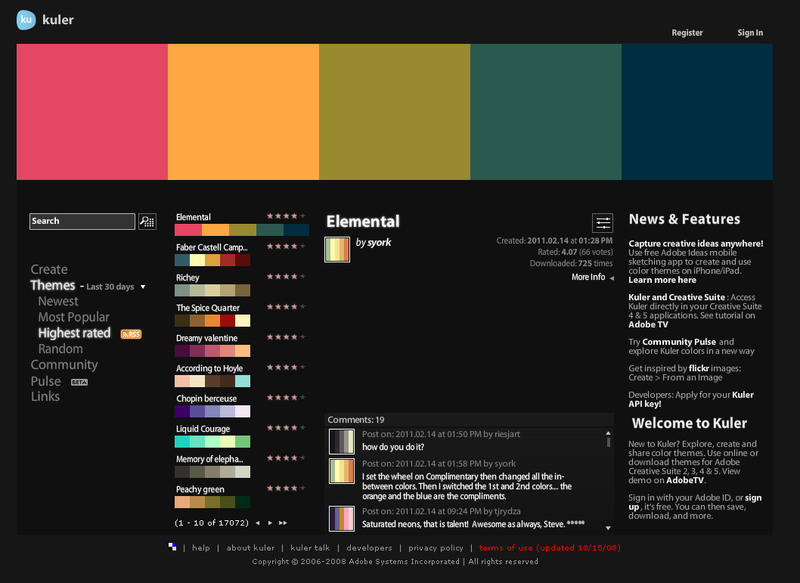 The name of the site is Kuler, and when you first go to the site, you see some color pallets. So you have the option of using other people’s color pallets, but the magic is under the create on the left side! 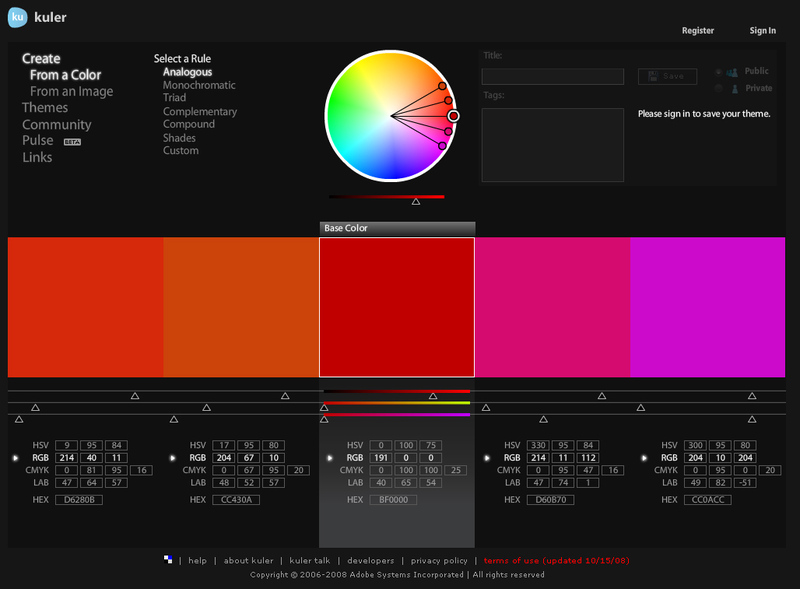 From the create menu, you can modify a color pallet from a base color. And this looks all techie and stuff, but you change one thing, and it changes the whole color pallet very easily. 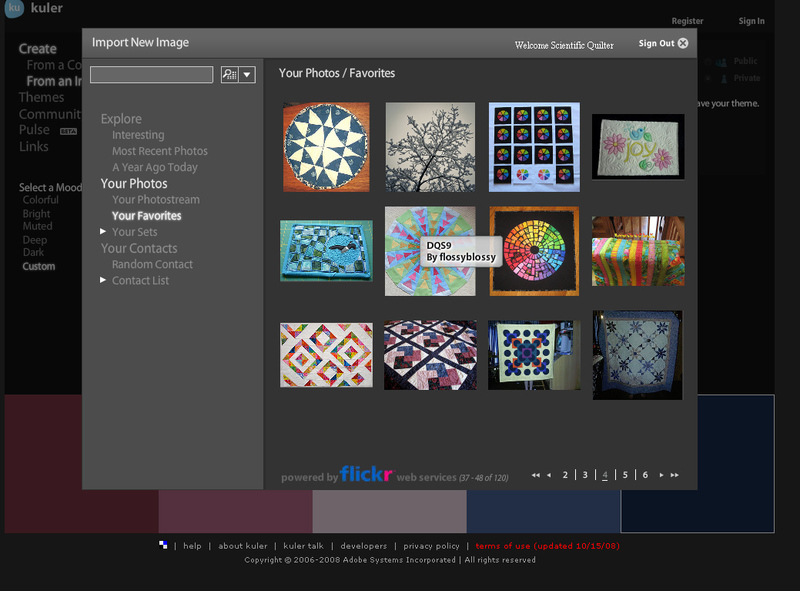 As you can see here, I have signed into the scientific quilter flickr website and I have zeroed in on my favorites quilt pictures from flickr. And I can pick any one of these pictures to delve the color pallet from it! Here I have a picture from Jackie_Quilts that I liked the colors, and I could easily pick a good color pallet from this quilt and translate it to another quilt! You can drag to areas of the picture that you like, or you can click on different color combinations, such as light, dark, muted. And you can save your color pallets if you register and sign in. This site is fun to mess with, and is VERY easy. These colors could be the inspiration for your next quilt! This was all my excitement after 20 minutes with the site, and I am sure there is more and more… you could take a photo from flickr of a non quilt, and it could inspire your next quilt color pallet! Ok, I could play on this site a long while and not get any quilting or house cleaning completed. I will have to keep my time in check when I visit here. Thanks for the info. Never relisten to my own podcast just minutes after listening to other’s podcasts that talk about rerecording the podcast and boring themselves and starting over. It’s never as good as you think, nor as bad as you think. Thank you for coming to my rescue. Open the correct post (one earlier) before making a comment for a reply.